April 20, 2014, was as close to perfect as a day could be. Having recently read the sad news that some pastors in our sister congregations in India have been viciously attacked at their own doorsteps by militant Hindu activists, we were blessed to gather, unmolested, with our church family to celebrate Christ’s astounding victory over death, and His promise to comfort those persecuted in His name. Once back at home, the sunny day waxed glorious, reaching upper-70s temperatures we haven’t seen for many cold and gloomy months. A leisurely dog walk; a relaxed late breakfast with my hubby; the luxury of a brief, restorative early afternoon nap. Next, I had volunteered roasted, glazed carrots. I didn’t want anything too rich or sweet. But this wasn’t a time to skimp on the taste factor, either. There was some good quality, organic, 100% apple juice languishing in the back of my refrigerator. Mixed with a number of on-hand ingredients that grabbed my attention as I trolled through the pantry, it translated to a crowd-pleasing, rave-inducing side which I had actually had the foresight to jot down the recipe for as I was concocting it. Here, I offer this successful experiment for your eating pleasure in your own home kitchen. Our Easter Sunday wrapped up with a relaxed gathering of dear ones for a great meal at the home of an amazing young woman – wife, mother of two, fulltime senior paralegal, and final-year law school student – who still manages to be one of the most poised and gracious hostesses I’ve ever encountered. Sitting on a sunny deck, watching “the guys” play their version of backyard baseball, with the family dog tirelessly chasing after the batted wiffle ball and the toddler making frequent passes through left field towing his little red wagon. How perfect is that? In a glass measuring cup, combine the apple juice and butter. Microwave just until butter is melted. Stir the garlic powder and spice into the butter/juice mixture. Arrange carrots in a foil-lined sheet cake pan and pour liquid over all, tossing to distribute. Sprinkle with dill flakes. Bake at 400˚ for 30-40 minutes, or until fork tender. With gray skies and a 48˚ wind-rattled atmosphere, today’s weather has dipped back into yucky territory – a “change for the wetter’ as our local weather pundit puts it. But if I close my eyes, I can recapture the feel of that sun-soaked deck with its view of two ducks landing in the neighbor’s backyard pond. Ah, Minnesota. It’s good for the imagination, if not the arthritis. April, 2014, southeast Minnesota. When I first started making notes for this post a few weeks ago, I recorded that the fifth day of spring brought us a wakeup wind-chill temperature of five below zero. I suppose I should have appreciated the symmetry of that statistic. Then on April 1st, we woke up to a 22-degree deepfreeze. And to lots of witty comments about Mother Nature’s April Fool’s Day sense of humor. Har. Har. 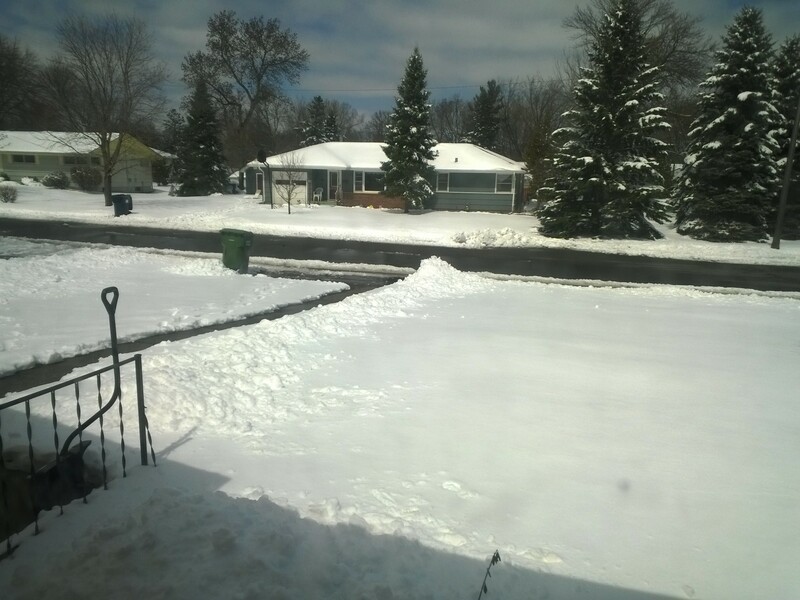 Now, having just returned from a week in ultra sunny central Mexico, we are a bit depressed over the idea of shoveling 8″ of wet, heavy snow out of the driveway on the day before Good Friday. (See above photo.) The one positive thing about a slow, delayed thaw after voluminous snowfalls was the advantage to people living in flood plain areas. What this additional accumulation means for them, I shudder to think. The flood-avoidance benefit was the one thing I reminded myself of when my shivering, achy bod moaned its way through another willpower driven exercise session. I don’t often “feel my age,” and the workouts definitely make things better in the long run. But the record-breaking cold of this season exacerbated my usually manageable chronic complaints, big time. And returning from sunbaked high desert territory to the ice-capped frozen north, well, we all know what extreme contrasts can do to throw a person off balance. As a distraction, and because we can’t be out planting annuals when the ground is still frozen solid, I turn to culling my humongous book collection. This is Phase One of a household commitment to clearing out and paring down – another sign of my advancing years, I suppose. That, and a recently discovered, urgent desire to sell our house and move south As Soon As Possible. …a regular reader of this site might just think I was on a rant about the disastrous situation in Detroit or the tragedy of having close to 50% of the nation’s population robbed of their dignity by a nanny government, with its womb-to-tomb assistance programs that imply the utter inadequacy of individual effort and mock the noble notion of self-reliance. A rant like that, maybe. But the above quote is taken from Sinclair Lewis’ 1935 novel, It Can’t Happen Here. I suspect that Mr. Lewis and I would not have shared political views on much of anything, and he was most certainly ridiculing the narrow-mindedness of his character’s anti-union comments, but the quote nonetheless reveals sentiments that echo true and relevant all these years later. This, according to another Lewis character from the same novel. With the addition of desiring to do good works in my retirement years, I could echo these sentiments as well. Does anyone out there know anything about South Carolina? I know it seldom snows and the housing market is buyer-friendly. But I suppose a little more information would be a good idea before we transplant ourselves and our three travel-resistant furry companions 1,215 miles from home. Culture-shock might again be an issue. Then there is that climate-shock thing, too. But I think it’s an adjustment I could tolerate. 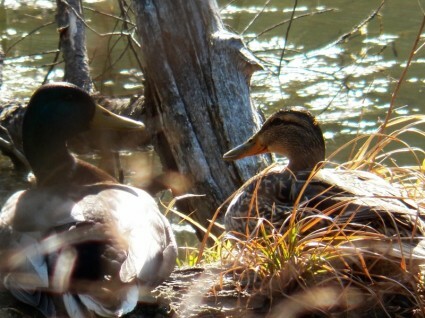 Having looked again at that snapshot I took this morning, I’m pretty darned sure it’s an adjustment I could tolerate.